This development is so cool that I bought a Galaxy S3 to check it out and flashed the precompiled build. I tried taking a picture with the rear camera with no microSD card inserted. The preview displays fine, but when taking the short (or better saving) I am getting a force-close of the camera app. Is this a known issue? Is this a good time to start putting this stuff in the issue tracker? Perhaps Paul could contribute there so everyone can see what needs to happen in order for this to be an official release and we all can pitch in to make it a reality. Wolfgang, are you going to keep posting new compiled images as cyanogenmod keeps updating upstream? A few things, and wondering if I'm the only one with these issues, or if there is a workaround one can do. - It feels laggy. I think it's due to the graphical affects. Anyway I can disable Android graphical affects? I believe I do have the proprietary firmware loaded and it still feels laggy (though I think better then before). Feels smoother then before but overall feels a bit slow/laggy. - Any firefox based browser crashes. Which is a pity as I like orfox and firefox browsers. If anyone needs assistance with getting the firmware loaded, please drop me a mail. Another member was kind enough to help me out. Can't update my post right now. I get an Internal Server Error. Not quite the way you describe it. Did you take a picture before or does taking pictures not work at all, under all circumstances? A logcat might be helpful. The camera should perform now much better. I switched to the version from CyanogenMod (which is based on Replicant's). Before, the last version from Replicant was used and there are issues when the camera locks up, sometimes already after taking the second picture. CyanogenMod's version doesn't include Paul's latest changes, so bringing the two versions together could be another future enhancement. Another nice thing is that the camera has now working face detection. There are already effects disabled. It's possible that disabling a few more improves the situation, but the real solution would be to work on the software renderer implementation. See #705. If the egl implementation can be completed, then Firefox based browsers would also work. It shouldn't feel slower than Replicant 4.2, except for the camera preview. Loading the firmware files should not make a difference in the performance of the graphics rendering. Thank you for the update, I will definitely check this out! Taking pictures did not work at all. I could see the preview, but as soon as I took the picture (where it would be saved) the app crashed. I then inserted a microSD card and formatted it to be used as internal memory. Since then, taking pictures worked. Regarding building: Do you think it could be a good idea to develop a docker build to ease the building process? Not sure if Docker is considered to be libre enough though. Just tried the new 6.0 alpha 0004 but ran into a severe issue: F-droid fails with an error "Error getting index file" when trying to update package data. Removing cache or all data for the app does not help. I am also trying to build from source, from a minimal Debian Jessie chroot, and so far ran into an arguably minor issue of needing the CAcert.org certificate to clone https://git.replicant.us/replicant/packages_apps_replicantwallpapers (apparently only that one has the problem). I suggest to either use git protocol or mention the requirement in bootstrapping notes. How would I load/install a zip file? I would expect it to be quite easy via the recovery. Though from recovery I select "apply update" -> "choose from emulated" and it says failed, failed to mount /data. (my phone is encrypted). sudo adb sideload fails with the same error. Do you have TWRP installed? is there any more news on replicant 6.0? Are we any closer to seeing it hosted here, as a "blessed" release? Does USSD services work for anyone else? I can't use any USSD services. Similarly I can't set basic phone/call/operator settings like to display my number when I call someone and not show private number. I tried installing this using the binaries and it doesn't recognize my SIM card. Are there logs that I should show or other diagnostic tests I should try out? I just successfully installed replicant6.0 (0004) on my S3. - the notification / battery LED settings are kind of confusing/broken. When I click on the menu item to select a color, the LED switches on, and I can select a color. When I then rotate the screen, the LED starts pulsing, and the pulse settings show up under the color selection. Also, the LED seems to light brighter when setting the color than later on when for example charging. - I had 2 random reboots in 2 days. - the camera app crashed several times. - It's somewhat laggy. I don't want to spend my time waiting for my phone to render (unneccessary) animations. I'm currently (since 2 hours) using Mali blobs again, but I feel really bad about it. Probably gonna remove them again. On the one hand, I find it pretty amazing how fast the open source graphics driver already works. However, on the second hand, I'm somehow just much more productive with the proprietary graphics driver. - (not replicant related) Android becomes bigger and bigger, and I definitely don't like that. 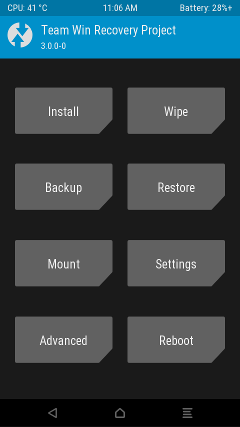 These touch bubble in the settings menu... uhm, no. Also, too much eye candy, even w/ all animations I could find disabled (this 'reached end of scrolling' animation, ugh). - (not replicant related) I like the CM11 appearance much more. It's more simple. Android M confuses me (these two dropdowns for example). Sorry for complaining that much. And thank you again for the great work! I find it pretty laggy even with the proprietary driver. There is LeafPic from f-droid which is great (and newish). I personally don't using this LED and disabled it, since I using this ROM, (over Settings -> Display & lights -> Lights...). However I noticed a little bug, too. If the power/USB cable is connected while the device (re)boots, the LED starts to glow and after the boot process is finished, it keeps on - even (the light is still disabled in the settings), if I remove the cable, send it to sleep and so on. I daily use this ROM since a few months, now. I also had 2 unexpected reboots, but in the last 3 months. For me it's laggy, but almost stable. I'm using Open Camera and I have a strange problem with the camera functionality, too. The app starts and appears to work great. But I just can take 1-3 pictures, before the app still works, but can't take any further pictures. If I close the app with the back button, I still can't take more pictures. While the app closes and starts without any problem, I have to kill the camera process though, start the app again and can take the next 1-3 pictures. Like Divan Santana said already, LeafPic is a really great, well working alternative. Hope this is not too much OT. Wow. Personally, I'm definitely okay with the prop. driver. The only thing I notice: There is a ~0.8s delay when turning the screen off, and ~0.5s when turning it on. Hm, I still could not figure out how to get the settings menu dark. This entire theming concept confuses me. But I tried Greyscale again, and I think I stay with it. While experimenting, I just had a very weird flickering when scrolling through my apps or switching homescreens. After pressing the home button/opening an app it was gone. I had this 4 times now, but could not reproduce it. It mostly occured while switching themes (only 'Style' and 'Status bar'). But yes, there's definitely an issue with it. With the proprietary graphics driver, the camera issues seem to be gone for me. I had them with several camera apps iirc, and in a similar way you (My self) describe. Yeah, I tried LeafPic again and got it working :) (After rebooting, my pictures finally showed up. And it's really good. It has far more options than the CM gallery app, and it looks nearly as good as it. Thank you for that. I'd have probably missed it otherwise. //update: Oh, I just realize that this is probably Mali-related and will keep quiet until I see this with software gl again. Sorry for that. Perhaps it's not the graphics that is slow for me, but rather the system performance. Maybe it runs out of mem or swaps or something. But at time's I found it really slow. - no more flickering (I had that only w/ proprietary mali driver). - LeafPic feels a lot smoother than for example browsing the settings menu. yeaw :) I can live with that. - replicant stock camera app is buggy. one time it stayed dark, I had to restart it. And, clicking on the last taken picture in the top right corner crashes the camera app for me. By the way, are there any security concerns with publishing logcats? I think some MAC addresses could appear there? What about IMEI? Thanks for any hints on that! Can I modify the lockscreen clock to the same as the homescreen clock widget? I like the thinner font much more. I just encrypted my Galaxy S3 running Replicant 6.0. Now I notice some notifications on every boot: First the Replicant logo appears for about 35 seconds. - "Preparing CM settings storage." Then I get asked for my encryption password, and finally Replicant finished booting. vdc cryptfs changepw password "short lockscreen password" "new very long and secure password"
Asking on IRC, I was told that this has maybe something to do with some apps missing information from the encrypted partition, thus optimizing again every boot. Just wanted to document it here. I used the latest precompiled image from the original post and followed the instructions closely. First of all, thanks a bunch for working on this! On the FSF forums and IRC everyone agrees that Replicant is a critical project. However, for some reason, it does not attract new developers. Paul has been fighting hard to keep it afloat all by himself. I bet all Replicant users are grateful you were able to step in and embrace the 6.0 port. This port is really a must to keep Replicant alive. A lot of new apps are showing up on F-Droid without Android 4.2 support, things are starting to look ugly. I have one spare Galaxy S2 I can ship you. If you are up to it just drop me a line. Taking a look at the issue tracker and forums, the Galaxy S2 seems to be on par with the S3 in terms of number of Replicant users. The other two (Galaxy Nexus and Note 2) seem to have only a few users.